System Requirements: 3G Data connection for best results, can use EDGE if necessary. Some stations cannot be streamed in-app, but can be streamed on the web. Summary: Sometimes you feel like going old-school with your streaming content. Why be burdened with music-only or a mostly-ad free podcast when you can hear terrestrial radio, the way it was meant to be heard, long ad-blocks and all. Seriously though, sometimes you just need to hear local radio, for either breaking news, local interest pieces, and more. 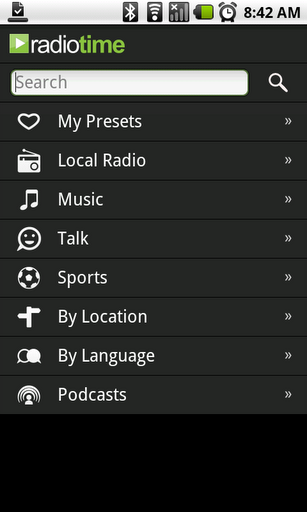 RadioTime for Android fills this gap at a fairly low price. But how does this trial-less app match up on an actual device used by an actual Android Thoughts editor? Read on to find out more! Figure 1: Jon's Presets (Yes, I listen to news radio...). Notice how the little arrow next to 105.7 is grey - yea, that's annoying. You won't be listening to that station on your Android headset (however, it can still be marked as a pre-set for listening through the RadioTime website). So, assuming you've got all of the radio stations you want to listen to all queued up, how is the experience? Well, pretty ordinary actually. While listening to an active stream, you get to see the station logo, the stream rate (in kbps), and simple controls to pause and restart the stream. If you lose data connection for any reason (e.g., switching from EDGE to 3G) expect a 5-10 second gap while RadioTime recovers. It's also worth noting that many stations live feeds are 20-30 seconds behind their over-the-air feed, so if you're listening in your car and then tune in via RadioTime while walking to work, you'll probably hear the same 10-20 seconds of airtime you just heard. Gives you a nice pause to leisurely put on your headphones though, right? As noted above, presets can be set and even synchronized with the RadioTime website. Unfortunately you cannot create an account on the device, you must sign up from the website. This isn't a big deal but is a small hassle if you just want to stay on your device. From many of the pages above (including the main screen and the presets), pressing the "Menu" button on your handset will bring up a page allowing you to enter your username and password for sync. And that's ALL it brings up - there are absolutely no customization options. I'd love to see something like buffer time or quality controls (e.g., so I can buffer 2-3 minutes so that any data interruptions don't impede my listening). It would also be nice if Bluetooth headset controls could activate / deactivate the stream. Figure 3: Local stations for the NYC area - RadioTime only shows stations that can be listened to, and includes a few duplicates for unknown reasons. So an app that can play some stations, mostly reliably, and can sync with a website that provides a free service. Why would you want to pay $2.99 for it again? Well, for starters, do you have a better way to listen to terrestrial radio on Android? If so, I'd love to hear it. While the browser on my Nexus One is not half-bad (as mobile browsing experiences go), I'd still shudder to go to a graphics-laden radio station website and try to find the listen button (while praying it doesn't launch some java or flash applet). Simply put, RadioTime charges you $2.99 because they did the heavy lifting. That being said, I wouldn't buy this software unless you had some specific uses in mind for it. Here's why I bought it: I hate news radio teases. I'd be driving to the train station at 6:10am and hear something like "In 10 minutes we'll tell you about a new miracle cure for all diseases and world hunger", and think "Darn, I'll be on the train in 10 minutes". Now RadioTime lets me listen to the not-so-exciting 10-minutes later news piece. Another great use would be for those of us who have moved out of our sports team's home market - for streaming games while on the go. While I wish it had a trial-version so that new users could check it out in advance, RadioTime for Android is worth the $2.99 simply to avoid the hassles of finding online radio that works with an Android device at this time. In addition, its streamlined interface (perhaps a bit too barren at time) is easy to navigate, and preset sync from the desktop to mobile is an awesome thing if you have any stations you want to easily tune to. Check it out in the Android Market. Jon Westfall is the Executive Editor of Android Thoughts, a Thoughts Media network member and home to great Android related news, discussions, and debates. He works in New York City as the Associate Director for Research & Technology for the Center for Decision Sciences at Columbia Business School.